Of what are made Car Sofa? CarSofa are made from real cars. This is not a plastic imitation products or non-original spare parts. Can I choose the color and upholstery? Yes, customer can yourself choose the color and material and carbody color trim. It also customer chooses the method of manufacturing-stitching trim. You offer writing desks with granite countertops, the stone is cold? Work desk let CarDesk made from the luxurious polished stone, which is installed on the underside of the electric heater (150W), which provides thermal comfort of the countertop. Switching to customer's time or thermostatic. The weight is between 20 and 40 kg. Most CarSofa move out 2 people. The customer can also equip CarSofa wheels for easy handling eg during cleaning. Do you made CARSOFA from my car? 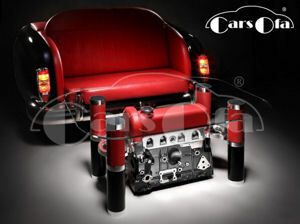 Yes, customers can deliver the vehicle itself, which will then be made CarSofa. What does is from the car produce? We produce especially CarSofa, then CarDesk - writing desks from the front of the car radiator cover interesting (especially Mercedes-Benz, Rolls-Royce, Cadillac, etc. ), CarTable - coffee tables from V8 engine blocks and more CarBed-bed with integrated front and rear of the car CarChair - office chair to the writing of the front seats, tables, coffee tables, cabinets, racks, stands for pens, business cards, trays and other interior lots of unique items. Can I choose to you from finished products? Yes, we have always avilable in stock a few CarSofa, coffee tables made of polished engine blocks and several cars waiting to be "cut" according to customer requirements. Can we produce a writing desk? Yes, the car is appropriate with an interesting front. We have in stock for example Rolls Royce Silver Spirit (1982) and Fletwood Cadillac (1992). How will you to prevent the tarnishing of polished wheels? Polished wheels for common use shall be provided with an outer clear lacquer. The effect of polishing is then permanent. There will be some loss of gloss, but the overall impression is still outstanding. The special tuning demonstration vehicles or vehicles not apply the paint. How much cost the complete renovation of a veteran? If you send us a detailed set of photographs and descriptions of all the "problems" that you want to solve, we are able to immediately tell the approximate cost of renovation. It depends on the age of the vehicle and the degree of preservation of the original state. Just an idea: fix seats (leather) + the entire interior including the roof is between 50 to 100 thousand. CZK, new paint + paint quality 1 (3 layers 4 layers of paint and varnish) between 30 and 50 thousand. Will you make CarSofa from each car? The car have to be appropriate for molding. This determines the selection of the type of limousine cars and coupes. It have to have integrated rear lights so that the resulting edge trim height from the floor was 45 to 50 cm. Give us your idea and select appropriate vehicle with you your favorite brands. How to strong is granite slab writing desk? Most 3 cm. Desk comes to install the table at the place chosen by the customer. It is because of the weight. For example, granite slab measuring 150 x 100 x 3 cm and weighs about 130 kg.